Butterflies Garden Restaurant: 535 Wat Bo Road. Phone +855(0)63 761-211. Open daily from 09.00 am till 10.00 pm. 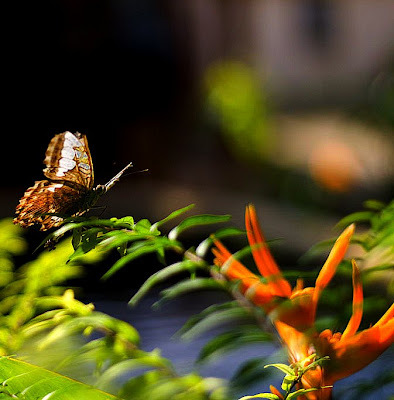 Hundreds of butterflies among hundreds of flowering plants and fruiting trees. 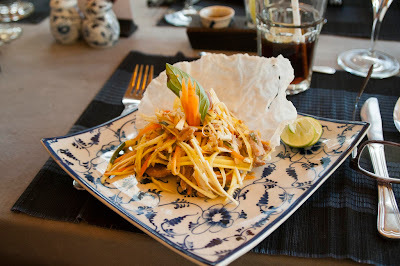 Khmer, pan-asian and fusion cuisine. A 45 minute traditional dance and music performance can be seen every Tuesday evening, starting at 7:30 p.m. The restaurants has a social mission: "The butterflies in our garden are purchased from youth living in a poor village near the Angkor archeological park. Many of these children are able to use this income to attend school. For those who remain unschooled, we are establishing Khmer and English language literacy programs, including food supplementation." Quite good reviews on tripadvisor.com, but the food seems not overwhelming. Read more about the children, who have to catch butterflies on guardian.co.uk. Cafe Indochine: Sivutha Road. In a traditional Khmer wooden house it offers Royal Cambodian Cuisine. It has an extensive wine cellar and a garden. Open daily 10 am till 15 pm and 17 pm till 23 pm. Ther are quite a lot of critics about the food on tripadvisor.com. 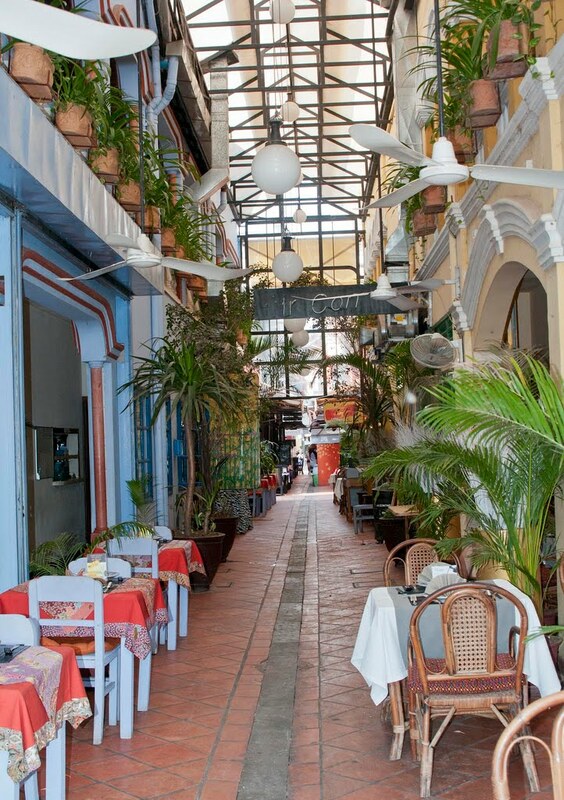 Champey Restaurant: The Passage Pub Street Alley. In the heart of the old market area. 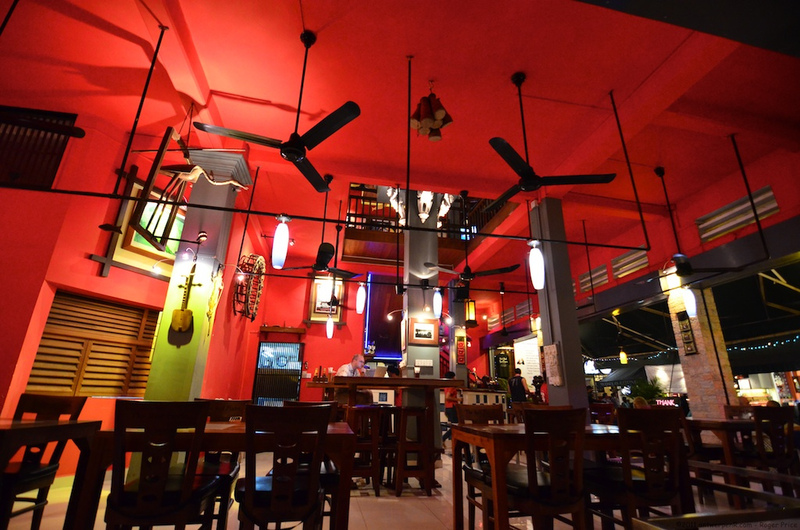 Serves Royal Cambodian Cuisine, seafood, barbecues, Thai, Vietnamese and Chinese food varieties. Open daily from 11.00 am till 23.00 pm. Good reviews on tripadvisor.com. See and read also the review by blurpenguin. 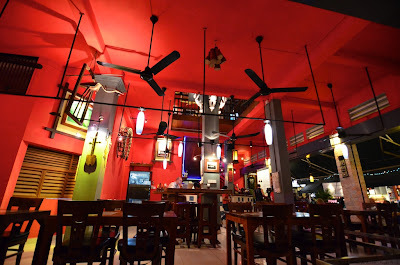 "Beautiful decor and an effort to create some of the finest Khmer food in the Pub Street area", notes travelfish.org. Cuisine Wat Damnak: You won’t find traditional Khmer food such as amok on the menu. Cuisine Wat Damnak wants to introduce you to unique, locally sourced, often rare ingredients that you may never even have heard of before. You might try fruits such as ambarella, Java feronilla and kuy fruit; eat local fish and shellfish unique to the Mekong and Tonle Sap lake or sample fresh lotus seeds, wild lily stems and edible flowers. Using only local fresh seasonal produce French chef Joannès Rivière creates exquisite Cambodian food. Mouthwatering delights as braised pork shank with star anis, caramelized palm sugar, fresh bamboo shoots and crispy trotter; steamed Mekong langoustine with rice wine and Kurata pepper; and chocolate and holy basil ganache with rice praline. 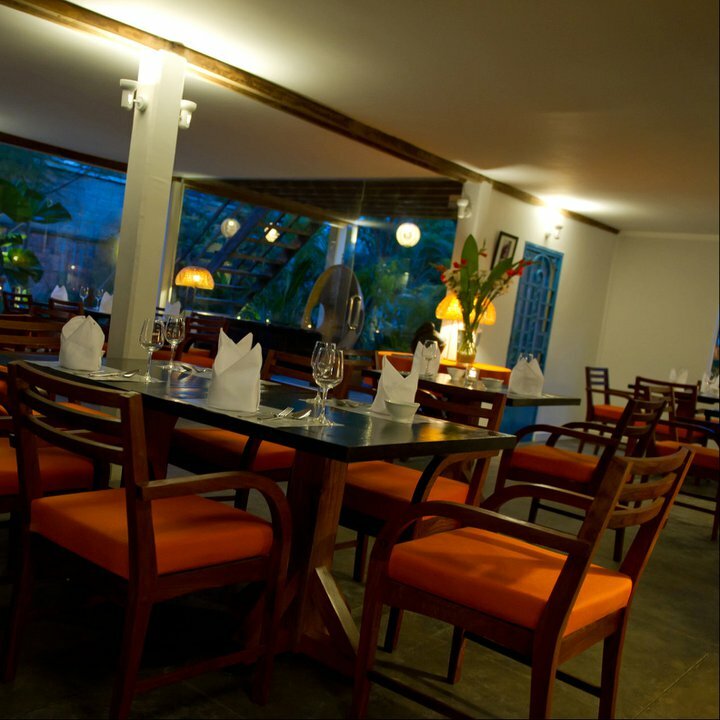 Cuisine Wat Damnbak is set in a beautifully lit traditional Khmer house and garden. The vast majority of the ingredients are bought daily, fresh from the local markets and through a local womens’ cooperative. Read more by Nicolas Lander in Financial Times. "French-khmer cuisine lovers choice" is one of a lot of excellent comments on tripadvisor.com. Read and see more on Chuzai Living. 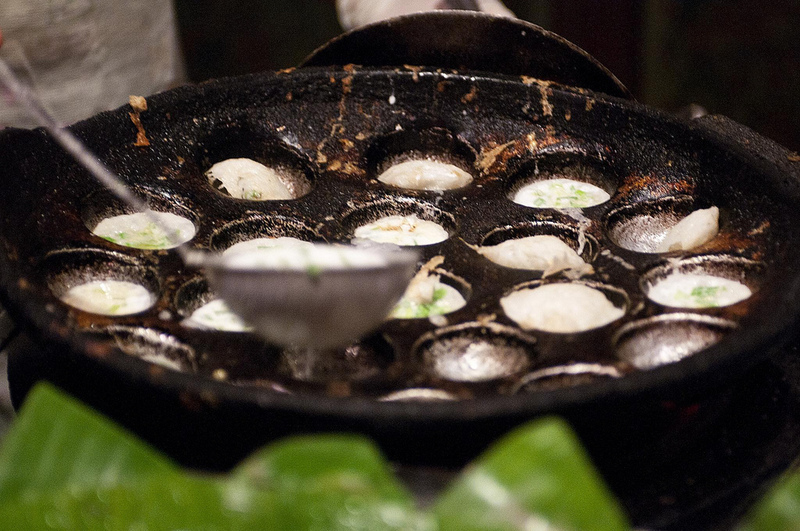 "Native Cambodian ingredients are used in an entirely different way, some staple dishes are given a fresh spin, and everything is served progressively in courses", notes Kaylene Hong on Wallstreet Journal blog. 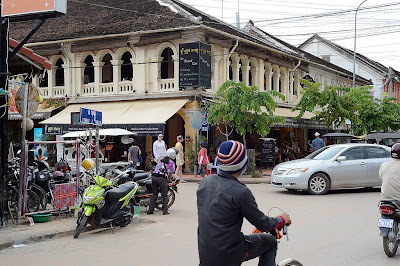 Khmer Family Restaurant: Pub Street. 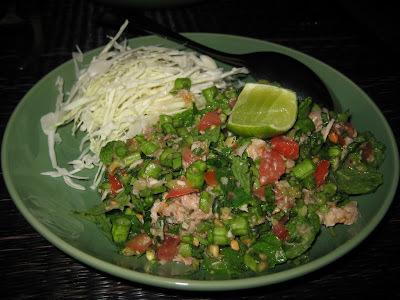 Khmer cuisine with traditional ingredients. Open daily from 07.30 pm till 21.30 pm. "Good solid Khmer food" according to reviews on tripadvisor.com, and inexpensive. And a nice point for watching people on Pub Street. Read the experience of Traveling Mark. mmm-yoso!!! found here "Somloo Caco (Samla Kako)", and this tasted "very much like a mild green fish curry". Sugar Palm: Taphul Road. "One of the best upscale Khmer restaurant’s in town", says Mark Bowyer on rustycompass.com. It is set in a traditional timber house. Good reviews on tripadvisor.com. "This is the place where food and beverage managers from nearby five-star hotels come to feast", comments Frommer's on nytimes.com. 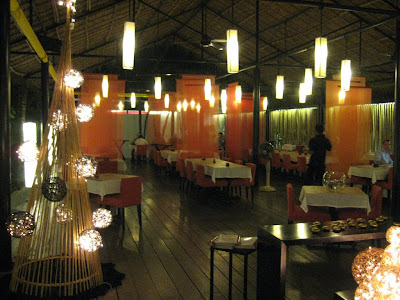 The Touich Restaurant Bar: Barbecue and Khmer dishes. Open from 5 pm. 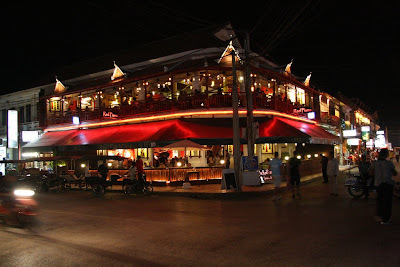 For the reviewers on tripadvisor.com it's the number one restaurant in Siem Reap. In one word: amazing. Viroth's: 246 Wat Bo Street. Phone +855(0)12 778096. Open daily from 11.30 am till 14.00 pm and from 17.30 pm till 22.00 pm. 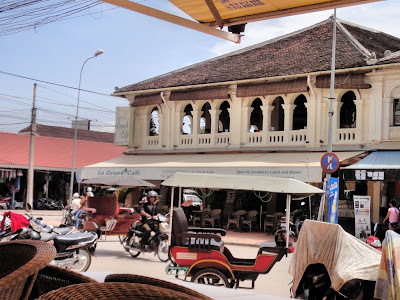 One of the best Khmer Restaurants in Siem Reap. "Great" say many comments on tripadvisor.com. Houben77 shows Viroth's on youtube. Read and see more on Word of Mouth. 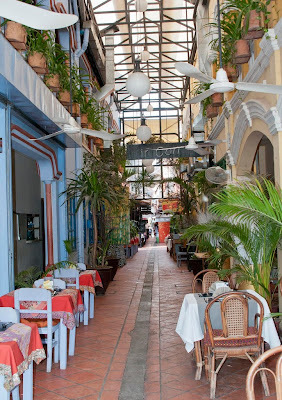 Le Grand Café: Old colonial building and with old paintings of elephants all over the walls: "The place has History and you can feel it", notes allega on tripadvisor.com. Good food, buit not the best place for Khmer food, say other reviews. Coffee and ice creams are delicious, wine is fine, adds travelfish.org. And see what they do with the tableclothes on youtube. Koulen 2 Restaurant: Sivatha Street. Restaurant with Apsara dance performance. Can be crowded according to reviews on tripadvisor.com. 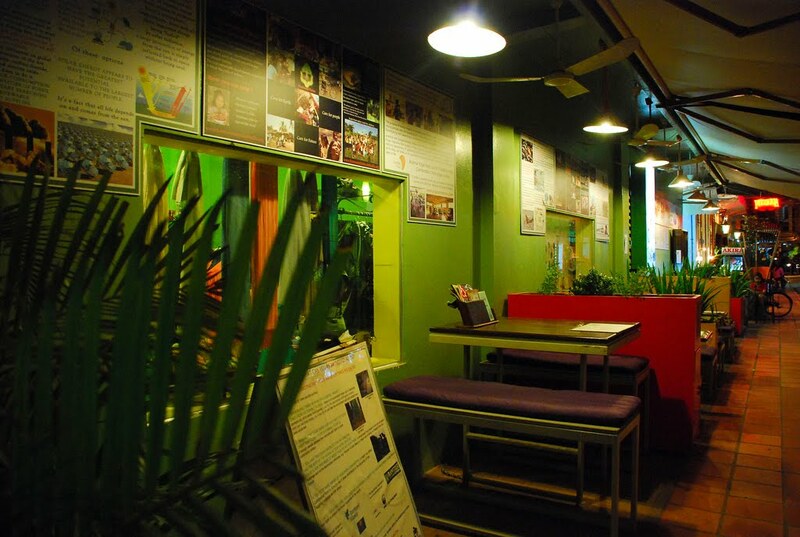 Moloppor Cafe: River Road (between Samdech Tep Wong and Street 22). Many types of food from Japanese and Western to Khmer for very reasonable prizes according to reviews on tripadvisor.com. Recommended by fashion designer Don Protasio. He writes: "So popular with all the locals you'll surely bump into someone you know" (in Destination Asia). .
Red Piano: Pub Street. Phone +855(0)63964750. Open daily from 07.00 am till late. Famous for the "Tomb Raider" cocktail named after Angelina Jolie, who was at this restaurant. The Belgian chef also serves specialities like vol au vent or Flemish stew. Good place for watching people according to reviews on tripadvisor.com. Abacus Garden Restaurant & Bar: Road No 6 to the Airport, pass the Angkor Hotel, and turn right at the ACLEDA Bank. French and international food. Excellent reviews on tripadvisor.com. "A new chef and a new location have not deterred the loyalists", adds Mark Bowyer on rustycompass.com. Le Malraux: At the corner of Sivatha Street and street number 7. "The Art Deco atmosphere here could be a throwback to Cambodia’s golden age before the civil war", comments lonelyplanet.com. "Its French cuisine offerings are just passable rather than what you might expect from the setting", critisizes Mark Bowyer on rustycompass.com. Mixed reviews on tripadvisor.com. Carla's Mamma Shop: 636 Hadgang Street. On the little half street that runs behind Samdech Tep Vong Street. 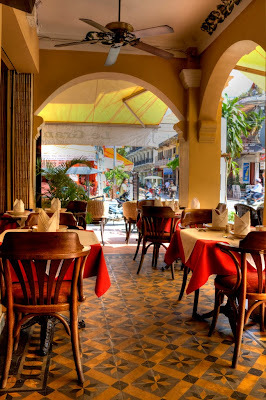 Carla Rosa, an Italian, is said to serve the best pasta in Siem Reap. The Sardinian opened an italian food store in 2012 and a little restaurant upstairs. Before with current owner Roberto Ferroni she was the founder of Siem Reap’s first Italian restaurant l’Oasi 2004, as Phnom Penh Post notes. L'Oasi Italiana: Pasta, bread and pizza are made by hand in the kitchen. Peace Cafe: Street 26 off River Road. 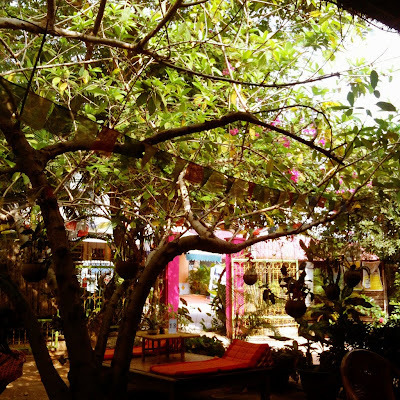 Fresh vegetarian food, a bakery and a fair trade shop. With traditional Cambodian chapei music on Thursday and kids dance on Saturday nights. They have excellent juices, note visitors on tripadvisor.com. The Singing Tree Cafe: Entrance of Alley West (The Passage). Phone +855(0)63 965210. It combines healthy food with engagement for projects like clean water or street children.Open daily from 08.00 am till 21.00 pm. 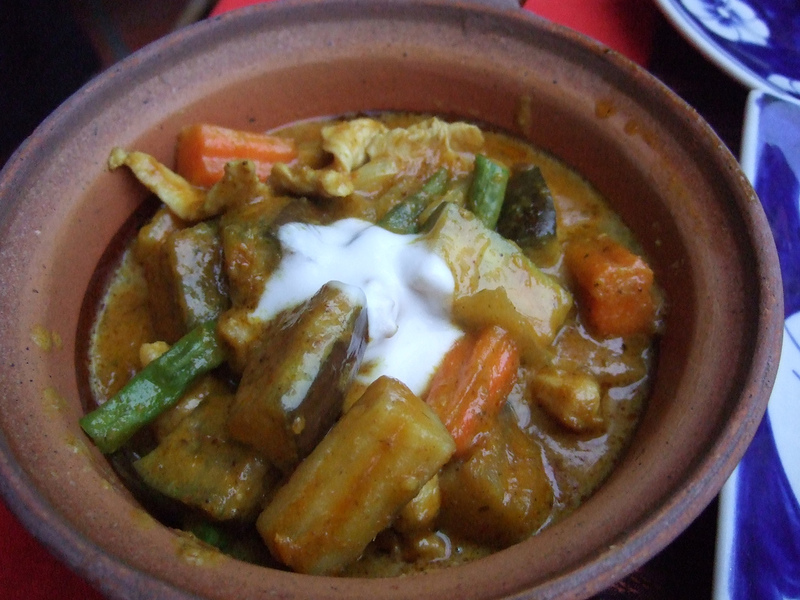 "Fabulous vegetarian food, western & Khmer, great service but everything freshly made so be patient if you have to wait - it's well worth it! ", comments a guest on tripadvisor.com. 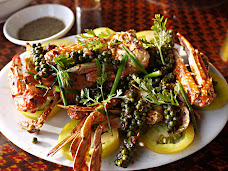 Read more on the Siem Reap Restaurant Guide by globaltravelmate.com and on cntraveller.com and on siemreapdining.com. Great post! 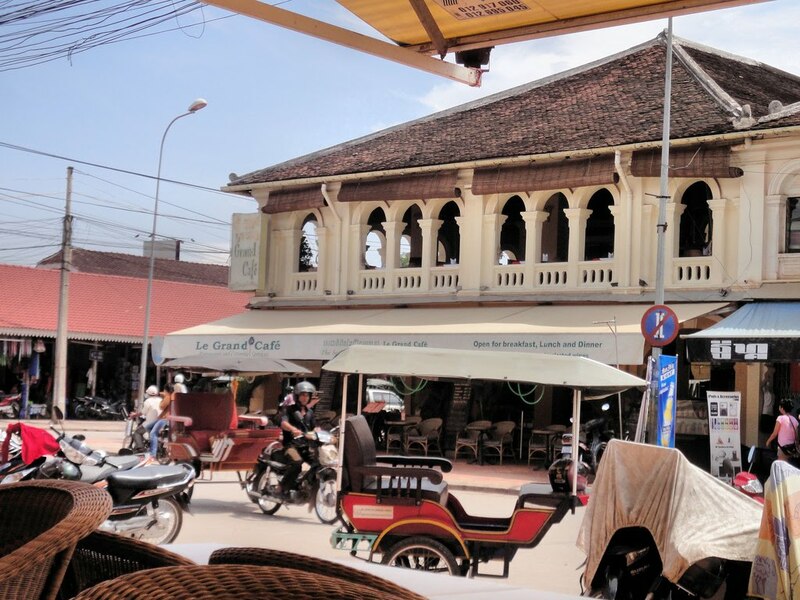 Check out these 5 recommended restaurants and food to eat in Siem Reap Cambodia as well! Cambodia's most beautiful place. 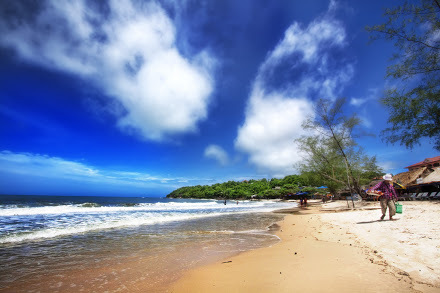 Siem Reap is fully relaxed place and many types of games and adventures can be played there. 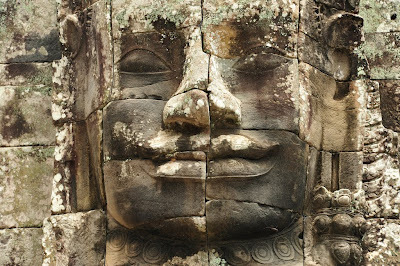 Beautiful places and the ancient temples can be visited in Siem Reap, Visit and Enjoy the nature in Cambodia.